Last weekend, I nibbled my way through the Fancy Food Show in San Francisco, where 1,300 food purveyors tempted attendees with samples of everything from “chocolate with benefits” to wine-infused cookies, bacon–flavored jam and 0-calorie yam noodles. After connecting with several local companies that I plan to visit and write about in future posts (Sukhi’s Indian food, East West Afghan bolani, Spicely organic spices), I took a quick spin through the International Section and swooned over French macaroons, Italian cured meat, and Brazilian cheese balls. 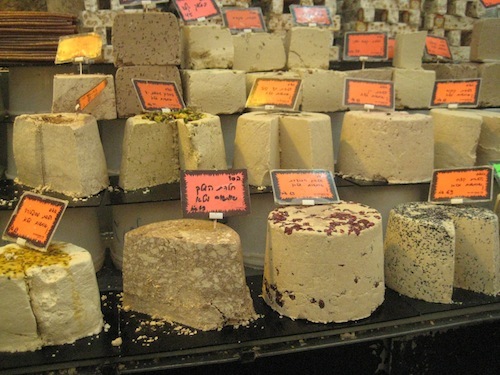 I almost walked right past a humble plate with tiny cubes of Turkish halvah. One bite of the rich, sandy sweet and I was transported back to my grandparents’ house (in a mental zoom like the mean food critic in the movie Ratatouille) where my Zaida (grandfather) would always present me with a bar of Joyva Halvah as a treat. I wondered how many other cultures share the love of this simple combination of ground sesame seeds and sugar. Wikipedia cites an impressive list of 30 countries, each with their own variant on a theme. Actually two themes: one type, popular in India, Pakistan, Afghanistan and Iran uses a semolina base. The one that is part of my childhood uses a nut-butter base, most often sesame seed tahini, and is found in Romania, Russia, Greece, Egypt, Israel, Lebanon, Turkey and Algeria. The useful Food timeline.org adds: “Halvah is of Turkish origin and was first sold in America at the turn of the century by Turkish, Syrian, and Armenian street vendors…The candy soon became a favorite of the Jewish immigrants in New York, and today halvah is still associated with Jewish delicatessens, even though one of the most popular commercial brands still depicts a turbaned Turk on its wrapper”. That would be Joyva. Ukrainian Jewish immigrant, Nathan Radutzsky, ignited America’s love affair with Halvah when he founded Joyva in 1907 in Brooklyn, NY, where it still produces 38,000 pounds of the dense fudgy sweet every week. Grandson Richard Radutzsky oversees the production that requires hand-mixing to properly stretch the sugary strands. Curious, I popped over to my two closest Middle Eastern grocery stores for a little research: Zands on Solano and Indus Food Center on San Pablo. Zands is a combination café and grocery, serving fresh falafel, tabouli, baklava and many more Middle Eastern dishes. Their fesenjan (Persian pomegranate-walnut chicken) is the best. Groceries include spices, teas, fresh flatbreads, oils and pomegranate molasses. I found a package of Lebanese halva and large slabs of fresh marble and pistachio halvah from New York and bought some of each to compare. Monier Attar, who moved here from Iran in 1984 and opened her store four years later, told me she often eats halva for breakfast with feta cheese on toasted bread. 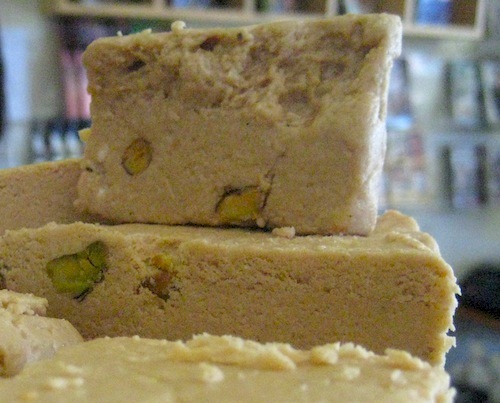 When I asked for her favorite kind of halva, she sighed and said, “Iranian, but we can’t import that right now.” (UPDATE: 3/26/11: MONIER ATTAR IS THRILLED TO FINALLY HAVE GOTTEN SOME PERSIAN HALVA, THE KIND SHE HASN’T TASTED FOR 30 YEARS. YOU CAN BUY IT AT HER STORE). Indus Food Center features a Halal meat market and a selection of groceries to satisfy customers from a wide range of countries. Amid the Lebanese nuts, Saudi Arabian cookies, Turkish soda and eight kinds of filo dough, I counted more than two dozen varieties of halva on their shelves, mostly from Lebanon and Turkey, in several flavors with even a sugarless option. I picked out three more versions and took them home for an informal comparison. I found the texture of the Turkish halvas crumbly, almost dry and really sweet. The Lebanese varieties were silkier and also, to my taste, exceedingly sweet. Then I tried the “New York” versions. Ahhhh, now that’s halvah. I guess Arfa and Monier were right: it’s what you grew up with that tastes just right. This entry was posted in Afghan Food, gluten-free food, Jewish Food, Lebanese food, Middle Eastern Food, Persian/Iranian, Turkey and tagged halva, halvah, helva, Indus Food Center, Joyva, Zands. Bookmark the permalink. Anna, now I have to run right out and buy halavah. My diet is over . . .
Alan, I completely empathize. It’s tough part of this new “job” I’ve given myself. Maybe I can look at carrot and celery dishes of the world next. I don’t know why I recently got a craving for Halvah. It’s so weird, but it was haunting me. 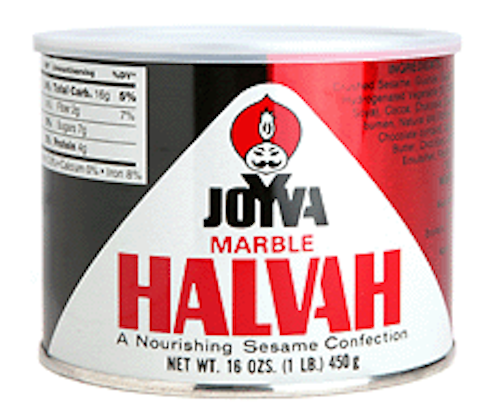 I just went out to the store in the rain here in San Diego and got a one pound can of Joyva Marble and I hope it lasts. It is so yummy and I love the fact it is based on Sesame seeds, which are nutritious, and purported to have a lot of calcium. 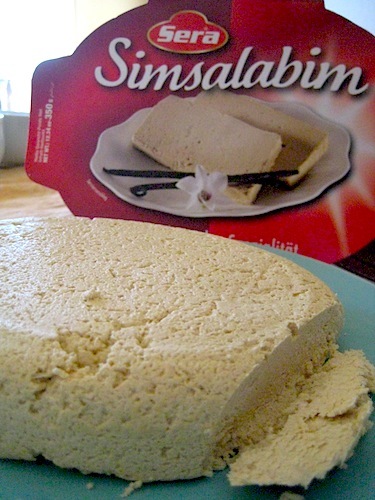 I used to have Halvah as a little girl and still love it. I can imagine it would be frustrating to crave something sweet in the particular way halvah is and not be able to find it where you live. Sorry, but I’ve never been to Thailand. Any Middle Eastern restaurants or shops nearby? Seems that almost anything can be ordered on the internet and shipped these days. Maybe from Australia? I wish you luck. Thanks for writing. Thanks for the quick reply ! I’ll check out Australia ……. Thank you for the good advice ! Hi Anna! I also live in Berkeley, and I am on a halva mission 🙂 The first halva I ever tried was from EZ Stop Deli on Shattuck. The stuff they have is amazing, and the store owner says it comes from Lebanon. 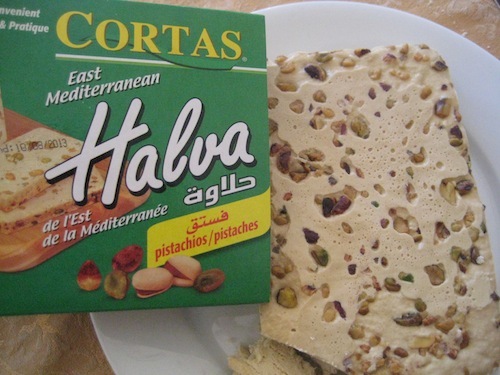 Have you ever tried their halva at EZ Stop? If so, which store-bought brand is closest to it? 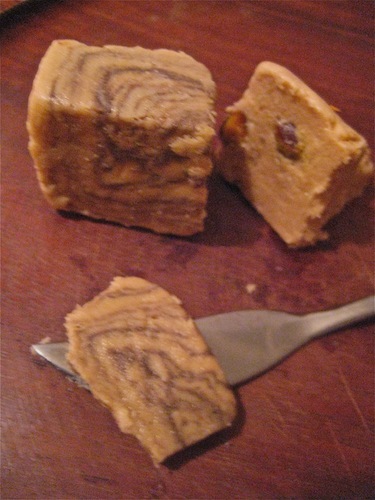 I am also trying to learn how to make halva myself, but I have not been that successful. Let me know! Small world! I have never been to EZ Stop Deli (even though I’ve lived in Berkeley for 7 years). I’ll have to try it out. Meanwhile, you should go to Zands on Solano Ave. It’s not far. I think that once you have “fresh halvah” the stuff that comes in wrapped up pales in comparison. Since I wrote this post, I visited Israel and that Halvah Stand (Kingdom of Halavah) that I took a picture of in Jerusalem is unbelievable! I couldn’t stop eating their chocolate halvah. And they give free tastes. Almost worth a trip to the Middle East. I’m very impressed that you are trying to make halvah yourself. Let me know how it goes. does halvah kingdom in machine Yehuda ship to the U.S. I am on my way to Zands! I have been looking for homemade Halvah since I had a taste in Europe 3 years ago. Thank you for the great article and the tip on Zands!! !